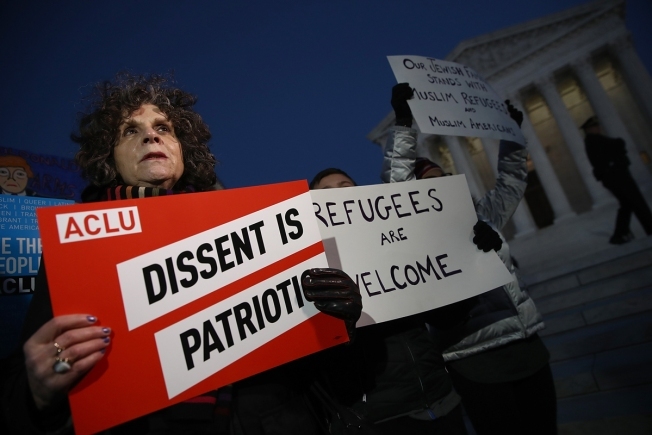 Protesters demonstrate against U.S. President Donald Trump's recent executive order on immigration outside the U.S. Supreme Court, Jan. 30, 2017, in Washington, DC. Members of Congress joined refugees, immigrants and members of the Washington DC community in protesting the Trump administration's recent executive order banning immigration from seven predominantly Muslim countries. Officials in the city of Portsmouth and the town of Durham in New Hampshire have begun discussing the process of making their communities sanctuary cities after Republican President Donald Trump's order on immigration. Portsmouth City Councilor Nancy Pearson tells The Portsmouth Herald she has asked the acting city manager to look into the issue. Pearson says she is not proposing that the City Council move forward with such a plan. Durham Town Administrator Todd Selig says the Town Council chair has been contacted by residents who are interested in the town becoming a sanctuary city. Officials in both communities noted the potential of losing federal money.